Facebook Chief Operating Officer Sheryl Sandberg will welcome a very special guest for a live-streamed conversation on Facebook Live Aug. 8 at 11 a.m. ET: Malala Yousafzai. 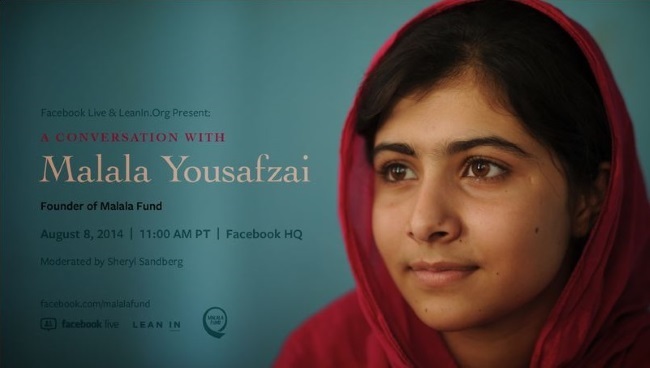 Yousafzai, 17, is the founder of the Malala Fund, a nonprofit organization with the goal of educating young girls around the world. However, she is better known for surviving an Oct. 9, 2012, assassination attempt by the Taliban in Pakistan, where she was targeted for voicing her options about women’s rights and education. Readers: What would you like to ask Yousafzai?